Previously Resident Representative of the World Food Program (WFP) in Senegal, Mr. Guy Mesmin Adoua Oyila is now the one who will lead this agency of the United Nations System in Benin. The new Representative presented yesterday, Wednesday, January 17, 2018, his letter of credence to the Minister of Foreign Affairs and Cooperation. The session was held in the courtroom of the Ministry in the presence of the Secretary General and the Director of International Operations. This letter of credence ceremony to the Minister of Foreign Affairs and Cooperation officially installed Mr. Guy Mesmin Adoua Oyila as the new WFP Resident Representative in Benin. This act will allow him to benefit from all the facilities due to his rank in the exercise of his function. The choice of Mr. Guy Mesmin Adoua Oyila, according to the explanations of Minister Aurélien Agbénonci, is not a coincidence: "He represented WFP in the Central African Republic in very critical situations. It has also effectively implemented school feeding programs in Rwanda and Senegal. " The Minister took the opportunity to draw the attention of the new Representative to the fact that WFP in particular and the United Nations System Coordination (UNS) in general are a strong support for the success of the National Food Program. Integrated School (PNASI) initiated by the Government of Benin. While wishing a very good career to the new Representative, Aurélien Agbénonci suggested that he regularly review the progress of the Program and not hesitate to collaborate with the Presidential Monitoring Unit (UPS) for any difficulties that may block the smooth running of the PNASI which spans a period of 4 years. For its part, the new WFP Resident Representative in Benin promised to address the main challenges for the success of the PNASI which is an example in the West African sub-region. 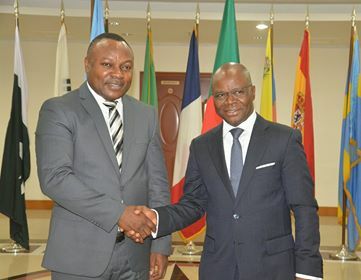 "Before my departure for Cotonou, the WFP Regional Director for West and Central Africa met with the President of the Republic of Senegal to talk about the Beninese experience and urged him to follow this example" said Guy Mesmin Adoua Oyila, before concluding that "He and his team will be up to the task entrusted to their institution"